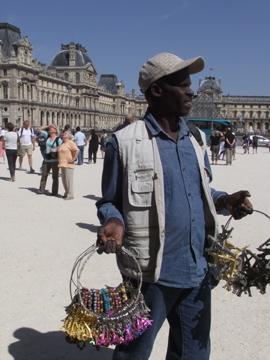 In French, the word “flâneur” means to wander around the city streets, strolling semi-aimlessly, enjoying the sights, the sounds, and the smells of every day life. If my first day in Paris was a high-speed tour of a jam-packed itinerary, on my second day I decided to slow down my pace, and do a little lounging about, like the locals. 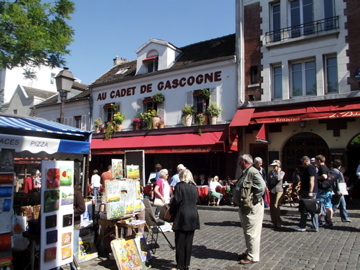 Luckily I was staying in Montmarte, which is a wonderful area for flâneur. A hilly part of an otherwise mostly flat city, Montmarte is perfect for strolling about through the tiny cobble-stoned streets, slowly climbing up the hills and taking in far reaching views of all of Paris below, including the Eiffel Tower in the distance. 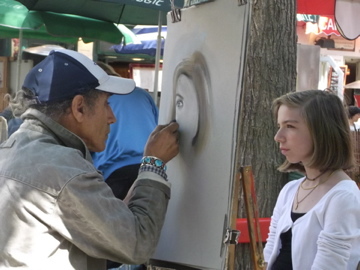 The area is primarily known for being an artist’s hangout, having once been home to the likes of Picasso, Dali, Monet, and van Gogh. 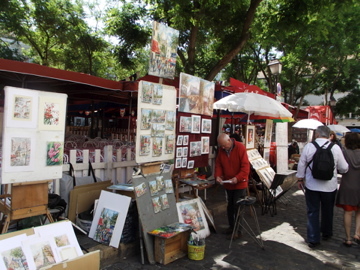 Today a small square hosts dozens of street performers, painters, and crafters. At 10 am, people were already sitting nonchalantly in the cafes, smoking and drinking a glass of wine. I can see why artists would like to live here! 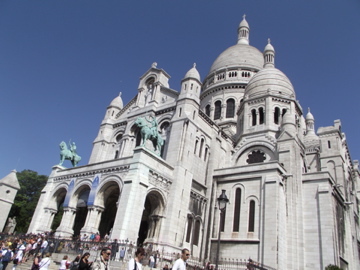 But above all, this hill top is famous for it’s beautiful Basilica of the Sacred Heart of Jesus (Basilique du Sacré-Cœur). Even from the street level in the area around my hotel, you can see the white domes of the Basilica towering up above in the distance. Still a functioning church, the tourists are luckily still allowed in, even during mass, once they keep quiet and follow the walking route around the edges of the main hall. I wish I could have taken pictures inside, as it is incredibly beautiful, but photography was forbidden. After enjoying the sauntering around, I headed back down into town, and hopped on the Metro down to the Champs-Élysées as I wanted to see the real Jardin des Tuileries and this was after all my last afternoon in Paris. 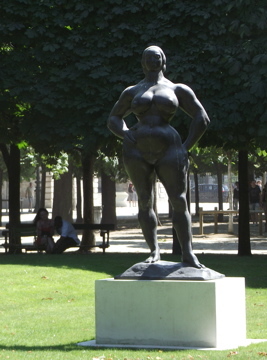 The Jardin des Tuileries also leads up to the Louvre, so I thought it would be a pleasant stroll. 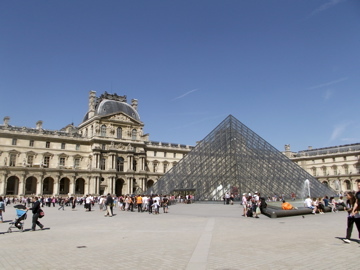 And then, since I was at the Louvre, I figured that although I had seen a lot of museums in London (which are all free, by the way… amazing), I may not get a second chance to see the Louvre, so I coughed up the 10 euros entrance fee and went in. I only had an hour, as it closes at 5.30, but at hour is better than nothing. Anyways, the following morning I boarded a TGV train from France down to Toulouse to meet my husband, and this is where we will stay for five weeks as he does some training for his new job. Lucky for me I get to tag along and take advantage of the situation! Although two days in Paris was great, I am very glad to be in a smaller and more laid-back city. 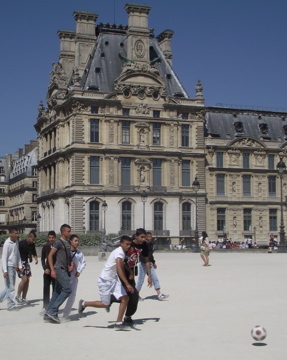 Paris was a bit overwhelming and fast paced, where as Toulousians remind me a bit of Tobagonians — they don’t seem to do anything in a hurry! Coming soon, Tales from Toulouse. Previous Post Adieu London, Bounjour Paris! Hello! to both of you. So fun to travel along with you. Have a wonderful time in Toulouse. love the pic of the “perfect woman”! Me too! And I loved the Italian art. At one point, you and me were the ideal…..